To improve the lives of children and adults facing developmental, emotional, social, and physical challenges through the benefits of therapeutic horseback riding. We teach children and adults with disabilities to ride horses. Horseback riding provides significant physical, mental and emotional benefits to disabled people. The horse's gentle movement results in movement of the rider's pelvis which mimics the human gait. It also increases the disabled rider's flexibility, balance and muscle strength and may reduce spasticity. Examples of riders we will teach include individuals with cerebral palsy, multiple sclerosis, traumatic head injury, post-stroke, pervasive developmental disorders, mental retardation, and individuals who have suffered emotional trauma such as veterans, first responders (NYPD, NYFD, EMS) and their families. We bring the joy of therapeutic horseback riding to people with disabilities in NY City, operating at two stables -- one in Brooklyn and one in Queens. GallopNYC is the nickname of Giving Alternative Learners Uplifting Opportunities, Inc., a non profit corporation. The organization is very organized and highly engaged with volunteers. It made me feel good seeing all the smiles on the kids faces and how much fun they were having. 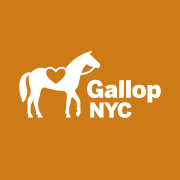 GallopyNYC is a great organization to volunteer with! It's very rewarding, the staff are quite knowledgeable and appreciate of volunteers, and you work with amazing students and horses. This is the perfect way to volunteer if you enjoy being outdoors, like animals - horses especially, and enjoy working with kids or adults that have various disabilities. It's such a unique and satisfying way to give back to the NYC community! Couldn't be happier with this way to consistently volunteer on a weekly basis and see the incredibly progress that is made with the students.